Dawson College hosts an annual Ped Day for Faculty and Staff, providing our teachers with the opportunity to share their teaching expertise, as well as learn from external workshop facilitators. This full day features a keynote address, as well as a rich variety of workshops, presentations and panel discussions built around Dawson community interests and suggestions. 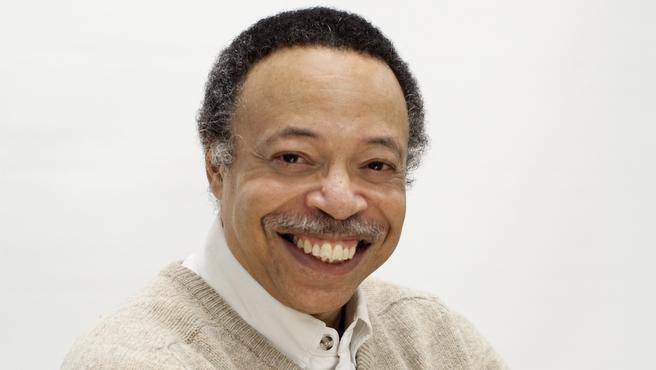 A revered artist in poetry, song, drama, fiction, screenplay, and essays, George Elliott Clarke is also a pioneering scholar of African-Canadian literature. Dr. Clarke, a professor of English at the University of Toronto, has held the prestigious role of Canada’s Parliamentary Poet Laureate. Dr. Clarke holds numerous awards and accolades including appointment to the Order of Canada at the rank of Officer, and eight honorary doctorates. Dr. Clarke is racialized “Black”, and identifies as a proud Afro-Métis Africadian, reflected in his writing on social justice and Canadian identity. 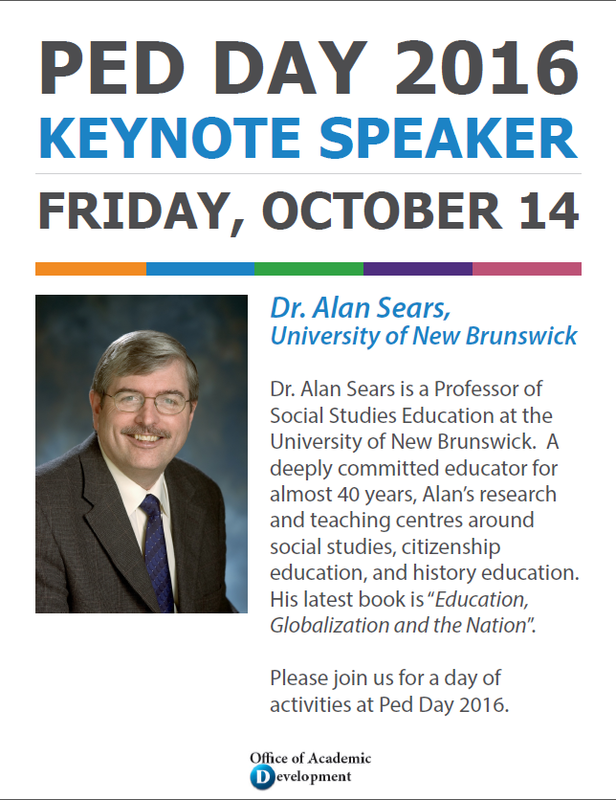 Join in Dawson’s annual Pedagogical Day for an engaging series of speakers and workshops. 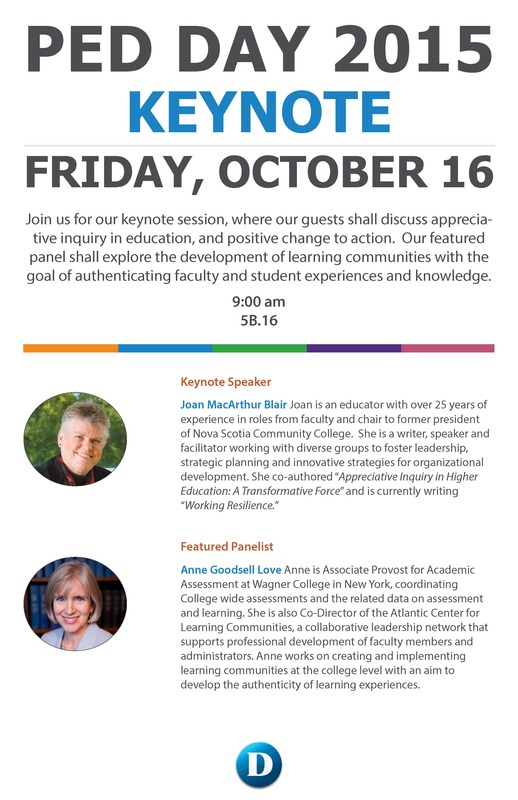 Randall Bass will discuss how the new learning ecosystem gives us an unprecedented opportunity to design course-based learning environments that address the whole person, bridge liberal and professional education, and can help students to become agents of positive change. 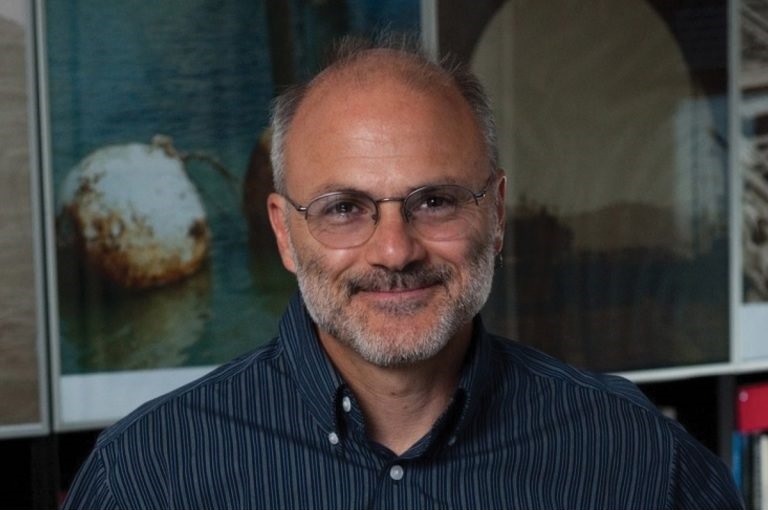 The keynote address will begin at 9:00 AM in the Multi-Purpose room (5B.16). A light breakfast is offered from 8:15am in Conrod’s. CRISPESH obtained a grant in 2016-17 for a project in which we established a framework for helping parents in designing bedroom that consider sensory needs of children with autism spectrum disorder (ASD). Our findings could interest teachers in the field of interior design but also anyone interested in ASD, and their environments. This panel presents both local and international initiatives that move from the classroom, to the community, to the world at large, and back again. Panelists will present his/her experiences and work, in a 15 minute presentation. These presentations are unified by their underlying themes of creativity, sustainability, student engagement and lifelong learning. Participants will be presented with concrete examples of how what happens in the classroom can make a difference to the world at large. This hands-on workshop will introduce you to using SMART Boards in the classroom. It is intended as a beginner course - no experience necessary. You will learn how a SMART Board works, how to turn it on and how to do basic trouble-shooting, how to use the pens to annotate Powerpoint presentations, with an introduction to SMART Notebook. A relaxed, group exploration of strategies, techniques and helpful tips to address the vocal and speaking challenges encountered every day in the classroom. This workshop will allow participants to pose relevant questions, dabble in voice and speech exercises and share experiences and solutions. This one hour workshop presents information about ‘Generation Z’ adolescents, their brains, and how teachers can proactively manage their unique strengths in the classroom. In a collaborative effort between the Office of Academic Development and the Student AccessAbility Centre, we encourage you to join in the conversation! In this workshop, you will learn the pronunciation, greetings, numbers, and even some basic Chinese characters! Please come join me for a fun introductory Mandarin Chinese workshop! How to get your colleagues to discover and use active learning pedagogy in their classrooms? Peer observation initiatives at Dawson and Marianopolis Colleges. "Peer observation of teaching is a great way to improve educational practice: voluntarily observing or being observed by a peer facilitates learning about and/or sharing AL strategies and how to implement them; reflecting on and getting motivated to change one’s own practice; and developing collegial relationships. Come hear about the peer observation initiatives at two Montreal colleges." Learn how to save seeds to grow your gardens and to integrate a sustainable activity to your teaching. Starting with how and when to save seeds, we'll move on to demonstrating how the Peace and rooftop gardens have been used to enrich active learning opportunities for students in peace, indigenous and sustainability studies. Participants will leave with seeds. This workshop will stimulate creative thinking and explore this year’s S.P.A.C.E theme: entropy. By working in groups, participants will create objects using 3D printing, as well as construct (and deconstruct) poetry through word games. Through art and words, participants will create, and learn how they can potentially bring S.P.A.C.E. activities into their classrooms. Part 1 of a 2 part workshop. What are some of the key elements of a great teacher? Do you welcome diversity and difference as an opportunity to learn and broaden yourself both professionally and personally? Do you prioritize respect and dignity as an important framing in the classroom? If these questions pique your interest, then this workshop is for you! Participants will be given the opportunity to experience Indigenous pedagogy, and participate in an opening and closing ceremony and to share thoughts, and views in the safety of the sharing circle. This hands-on workshop is intended for those who already know the basics of using SMART Boards and who want to learn how to use SMART Notebook software beyond the basics. Participants will learn how to use SMART Notebook features such as the creation and manipulation of objects, content and pages as well as lesson activities to create powerful and dynamic teaching and learning resources. This session focuses on new ways of thinking about professional development. It presents a set of innovative tools developed by SALTISE (Supporting Active Learning & Technological Innovation in Studies of Education), which brings authentic activities, developed by college instructors, together with learning principles – i.e., research. These tools will be demonstrated, and SALTISE initiatives, including its annual conference, will be discussed. Workspace Ergonomics: Work Hard. Work Right. Participants will be introduced to the principles of workspace ergonomics so that they can improve their office set up to either alleviate existing symptoms or prevent the development of symptoms related to poor postural habits when working at their desk. Recommendations/guidelines will be provided. What would an effective violence prevention curriculum look like? You will be introduced to an approach that integrates critical thinking and media literacy, while involving students in resistance projects that use photography, video and web-based media to foster a critical reflection on the cultural changes needed to foster a more peaceful world. Of particular interest for educators interested in designing peace pedagogies, or teaching about deeply rooted social problems without leaving students feeling overwhelmed and disempowered. Participants will learn about the DYNAMIX™ psychometric profile system and its application in work teams and classrooms. Participants will identify their unique communication preferences and their 4 key indicators of success. Participants will be given the opportunity to complete the 20-minute on-line questionnaire prior to the workshop and will receive their 31-page booklet on ped day. Jonathon and Sameer have developed a general data-mining platform that could serve all program coordinators, department chairs, and college administrators. In collaboration with Dawson, their Program Analytics web app will launch this fall. Please join this hands-on workshop where participants will be able to explore the corner of the college datasphere that corresponds to their own program, discipline or sector. This dynamic workshop will give you the opportunity to circulate among tables to explore different online teaching approaches (tools, techniques, strategies, best practices) and to ask questions to teachers and professionals members of the Dawson E-Learning Community of Practice. The workshop is open to anybody who would like to share and learn about online teaching at Dawson. This session will allow participants to explore a handful of student-centred active learning activities and strategies that have been developed and refined by teachers in the active learning community of practice at Dawson. The atmosphere will be relaxed but participants will leave with ideas and resources that they can use in their classrooms to engage students. Explore and utilise the new UDL website - a sustainable, bilingual, online, user-friendly toolkit, offering support to course instructors in their application of Universal Design for Learning in pedagogy. Learn about the results of a research project across five post-secondary institutions that examined facilitators and stressors experienced by course instructors in the implementation of Universal Design for Learning (UDL). Je vous présenterai les contenus utilisés dans mes cours, principalement au niveau 102 mais aussi à d'autres niveaux, ainsi qu'une proposition thématique pour le cours 103A. Les enseignants seront ensuite invités à partager leurs contenus et références, le cas échéant, et à échanger leurs idées quant aux oeuvres, thématiques et activités pouvant s'insérer dans leurs propres cours. This hands-on workshop will show you how to use different services in the cloud inside your favorite LMS. We'll focus on Office 365 (the cloud version of Microsoft Office plus other tools and a file repository called OneDrive), Youtube videos, audio/music files, slides and more! Come and learn how to cloudify your courses! Dawson is in prcoess of developing new facilities to accommodate our large student population. It impacts on our culture, our pedagogy, our program mix, our services to students, and has a tremendous impact on procedure in the College. This interactive session will share ideas and strategies of this significant moment for our work and our workplace. Join us for this bold visioning session on how Dawson will implement sustainability and well-being for all. Designed as a series of workstations featuring sustainability-related projects, you will learn, share, and help define how your program contributes to sustainability. Design how to use our campus for real-world learning as you engage with Dawson’s Living Campus initiative. Part 2 of a 2 part workshop. Continue working on teaching values and the development of Indigenous pedagogy for your classsroom. The workshop outlines how easy it is to enhance your students' vocabulary and grammar skills. Prepare your English class with precise bookmarks selected from thousands of entries. Detailed dictionaries and in-depth linguistic guides, as well as the advanced corrector interface, will assist students through the writing process. git and GitHub introduce students to a versatile workflow for collaboration. Although the tools were first designed with software development in mind, today they are being used for many kinds of written work. Our hands-on workshop will demonstrate how to use git to publish course materials, deliver feedback and enable effective teamwork among students. Interested in trying out peer reviews for a writing assignment in your course? Come get practical tips for successful implementation of peer review processes where we will model the method and help you develop procedures tailored to your specific course. Presenters will address theory, ethical concerns, and technology such as Turnitin and Google Docs. Teachers of all disciplines are welcome! Participants in this workshop will have the opportunity to learn from as well as reflect on and evaluate the pedagogical strategies of a conflict resolution process developed by staff and faculty in Fall 2016. This will be an interactive workshop that includes team building, aligning body and mind through a physical movement and meditation as well as non-violent communication strategies. Karen Ridd was the Ped Day 2012 keynote speaker. Available here is a video of her talk.